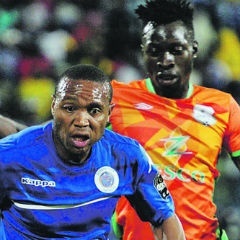 Johannesburg - SuperSport United will on Sunday carry the hopes of the nation when they take on Tunisian side Club Africain in the CAF Confederation Cup. This all-important semifinal clash will take place at Lucas Masterpieces Moripe Stadium in Atteridgeville. United are the remaining South African side in continental club competition after neighbours Mamelodi Sundowns were knocked out in the quarterfinals of the Champions League last weekend. Matsatsantsa a Pitori advanced to the last four of the continental event on away goals following a 2-2 draw in Ndola, Zambia, last Saturday. The Pretoria side has called on all South Africans to rally behind them, with #fillupLucasMoripeStadium already in full swing. United flags will be given out to the first 1 000 fans who come to the stadium, while free entrance will be granted to supporters wearing blue. Eric Tinkler, who guided Orlando Pirates to the final of the same competition three years ago but failed to lift the trophy, will be hoping for a better outcome this time. Tinkler also served as Roger De Sá’s assistant when the Bucs reached the Champions League final in 2013. Tinkler’s experience on the continent should stand him in good stead to go all the way to the final. But United will have to use their home ground advantage to good effect, unlike in the game against Zesco, when they failed to score at home. They made life harder for themselves as they had to dig deeper in Zambia. Winning a home leg and taking a healthy lead to the second leg is a must as conditions are totally different away from home and even match officials make things harder for the travelling team. But Tinkler has garnered enough experience to know what to expect. He also has experienced campaigners who should stand up to any kind of pressure. With six players in the previous Bafana Bafana squad, Tinkler should not worry about international experience in his team. Last weekend’s two-goal hero, Thuso Phala, seems to have rediscovered his mojo and, together with refocused Jeremy Brockie, they should give the visitors a tough outing. Brockie is back in favour following his request to be put on transfer in August. But he has put all that behind him as he wants to reach the final of this competition. Tinkler will also rely on the services of goalkeeper Ronwen Williams, defenders Morgan Gould and Clayton Daniels, captain Dean Furman and striker Bradley Grobler to do the job for him. Hopefully, South Africans will heed the call and rally behind United as they continue to hoist the country’s flag. The return leg in Tunis is on October 21.